(Bloomberg Opinion) -- Investors, allow yourselves to be enchanted by Disney’s magic, swept away in its magnificent story lines – and try not to be concerned with the usual financial complexities. In all the build-up to the unveiling of this product, what may have gotten lost is that this isn’t really about the app – it’s about the content, and it’s actually the same content for which Disney is already known and loved. While streaming chief Kevin Mayer described Disney+ as unique and “visually stunning,” the app itself is rather unremarkable, with a look and feel similar to Amazon’s and other video services. (That’s not a bad thing, considering consumers are used to the functionality.) Instead, Thursday’s event served mainly as a reminder of Disney’s unrivaled creativity and the breadth of its library, which was expanded last month with the addition of National Geographic, TV shows like “The Simpsons” and other assets from its $85 billion Fox deal. Disney executives spent the majority of their three-hour presentation essentially advertising the movies and TV series that will anchor Disney+, such as “The Mandalorian,” a Star Wars series, and “Forky Asks a Question,” a spinoff of “Toy Story 4.” They saved only the last few minutes to run through the more staid part – the numbers. Disney expects to have 60 million to 90 million Disney+ subscribers globally by fiscal 2024, which is when Hulu may also finally turn profitable. Thanks to the Fox deal, Disney now has majority control of Hulu, though it needs to confer with minority owners Comcast Corp. and AT&T Inc. in order to see through plans to bundle the service with Disney+ and ESPN+. Disney is already being commended on Twitter – where #DisneyPlus was trending Thursday night – for the relatively low price of the app; Netflix’s standard subscription is $12.99 a month. 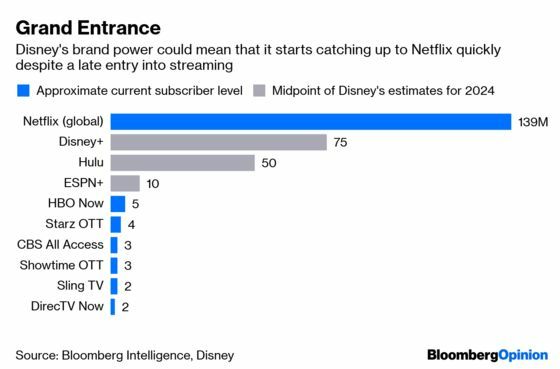 But the biggest surprise was that Disney+ will have all the Star Wars films, which required a deal with AT&T Inc.’s Turner business for I can’t even imagine how much money. Disney had sold the rights to past Star Wars films to Turner, so it probably needed to pay up big time to win those back. When the app is still in its infancy and has little in the way of fresh content – compared to the binge-ability of Netflix – subscribers may mostly comprise superfans of the Disney brand and its franchises, as well as parents. The company confirmed that the so-called Disney vault of animated classics will be available on the service from day one – and if anyone doesn’t mind watching the same old movies over and over again, it’s kids. That may make Disney+ a must-have for parents. For Disney+ to be truly successful and anchor a company that’s accustomed to earning $10 billion a year in profit, it needs to break out beyond that audience. Its price may be just low enough to entice casual fans who have already opened their wallets to Netflix and other subscriptions. What Disney executives didn’t address is how the presence of Disney+ may agitate the empire, though it has estimated there will be $150 million of foregone licensing revenue for its studio and TV-network divisions this year as a result of putting content on Disney+ instead of pushing it through other more lucrative outlets. That figure will only get worse as more content is preserved for the app. There could also be indirect adverse effects, such as fewer people going to theaters and instead waiting for films to be added to Disney+, and also an acceleration of cord-cutting. Disney brought in more than $3 billion in movie-ticket sales last year, Box Office Mojo data show. Its top 12 TV networks also generate about $15 a month per subscriber, according to Kagan, a media research group within S&P Global Market Intelligence. Knowing Disney’s perfectionism and Iger’s track record, I’m less worried about the ability to execute. But I do wonder who will ultimately make the tough decisions about where to direct content, how streamlined that process will be and what ramifications it may have on morale in other parts of the organization. It’s also not yet clear who will see the process through after Iger steps down in 2021, though Mayer would seem to be a top candidate. More important, I’ve realized that the flaw in Disney+ is its name. “Plus” implies that it’s an add-on, a supplement to the real Disney. ESPN+ is a supplement to the ESPN cable network, but Disney+ is supposed to be the company’s future. The name implies much more hesitance about that, as does the Iger team’s quickness to assure investors that they’re still totally committed to traditional TV. The question remains, when and how will Disney+ someday be just Disney?